The beginning: The first batch of the Crisil Certified Analyst Programme interns at the inauguration of the study and work course. New Delhi: It was in failure that Anirban Chowdhury found success. A commerce graduate from Bangalore University, Chowdhury sat for the common admission test (CAT), the qualifying exam for studying at top-ranking B-schools. He wanted to specialize in finance, but then missed the cut-off by a whisker. Much to his surprise, Chowdhury realized that the Crisil course had turned out to be an equally good, if not better, option than any B-school. “My short-term objective was to have a blend of practical experience and academic exposure. CCAP turned out to be exactly that. It was also mutually beneficial to both the teacher (Crisil) and the taught (me)," says Chowdhury. 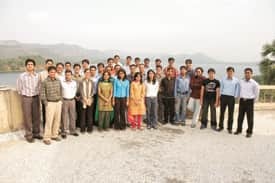 With 24 papers in finance, equity research and derivatives, the course covered communication, language and personality development, giving Chowdhury the confidence that his “employability quotient" would maintain a steady curve irrespective of whether he continued to work at Crisil, or not. In yet another sign of employers filling the gap in education, some workplaces are devising fast-paced training programmes that tap those who want to pursue higher education, but have been unable to do so. In the process, the companies gain a deeper talent pool and can also customize training and education to their specific needs. What makes the Crisil programme different is that while many financial services companies engage in such training, in the ratings and research domain in India, Crisil is the only one to have done so on such a large scale. The number of interns has gone up from 45 in June 2007 (out of 724 applicants), the first batch, to 75 this year. All interns at Crisil must be under 26 years of age. The firm also explicitly targets “the MBA aspirant who misses out on getting into a B-school by a narrow margin" (those who fail to clear CAT by five-six percentiles). They do not have to take Crisil’s aptitude test and can register for the course directly. For the rest, candidates appearing for the final bachelor’s degree, or an equivalent examination (with minimum 50% marks), postgraduates, MBAs, PhD students and those who are working, taking the exam is mandatory. “The motivation to start a programme like this came when we saw that there was a virtual war in the market for talent," says B. Ganesh, senior manager (corporate human resources) at Crisil. “Premier B-schools cannot meet the rising demand for industry-ready professionals. Our initiative was launched to augment our own talent pipeline and, in the process, contribute to building the country’s talent pool." Also, finance firms usually hire employees first, before deputing them to programmes such as part-time MBAs, refresher courses and weekend workshops. At Crisil, interns get a stipend and don’t have to pay for their educational expenses. It’s a convenient “paid-to-learn agreement", says Ganesh. That was also a huge plus for Chowdhury since he did not have to shell out any fee for the course and got a monthly stipend. There was also no bond stipulating a minimum period to work at Crisil. For Gunjan Mohanty, an economics honours graduate from Bhubaneswar, who is currently working at Crisil’s global analytical centre in Mumbai, the course made all the difference to her career trajectory. “Being my first job, the programme gave me immense confidence, building on my fundamentals, while allowing me to simultaneously apply it to my daily work," she says. “I could see myself evolving as a well-equipped finance professional. That would have taken much longer had I not gone through this structured study-work regimen." For recruitments, Crisil sent posters and brochures to colleges and to well-known MBA entrance examination tutorial centres across the country, besides placing advertisements. The company also relies heavily on word of mouth. The programme spans four semesters spread over two years. During the first month, interns attend classes full time to complete fundamental courses in finance as part of the induction process. Once the induction process is over, classes are held twice a week. During the rest of the week, interns work in assigned business units of Crisil as part of their internship programme. Faculty comprises handpicked professors from leading business schools, industry experts and senior Crisil professionals, and the course curriculum is designed in-house to fit largely to the company’s own needs. Once the internship is over, the interns are placed at the same level of seniority.